Sutton Associates' investigators ample indication that he has purposefully not disclosed everything he knows about October 30, 1975. For example, on April 7, 1976, Littleton was asked to sign a statement, put before him by the Greenwich Police Department, documenting circumstantial evidence against Tommy (essentially that he was out of the house for x period of time when the murder was alleged to have occurred). Littleton refused to sign what he had already stated to be the truth, on the grounds he believed Tommy was innocent. When asked about this occurrence recently, Ken denied it ever happened. After Littleton gave indication, through certain remarks, that he may have seen Michael outside on the night of the murder, our investigator pressed him on this issue as well. First, Littleton denied making the comments in question. Then, asked if he had seen Michael outside that night, Ken said,"No." Would you tell us if you did? asked our investigator. Tellingly, Littleton replied, "No." Littleton has something to say, but is unwilling to say it. "I have a definite feeling in my mind," he told our investigator, "that this murder was committed after 10:30 at night." "Why do you say that?" he was asked. "Because," he responded cryptically. 3. Ken Littleton knows something, but is holding back. - establish the foundational paradigm upon which we will now speculate with what evidence we possess: Tommy and Michael are somehow involved in the murder. Littleton is somehow a witness in a state of complicity. 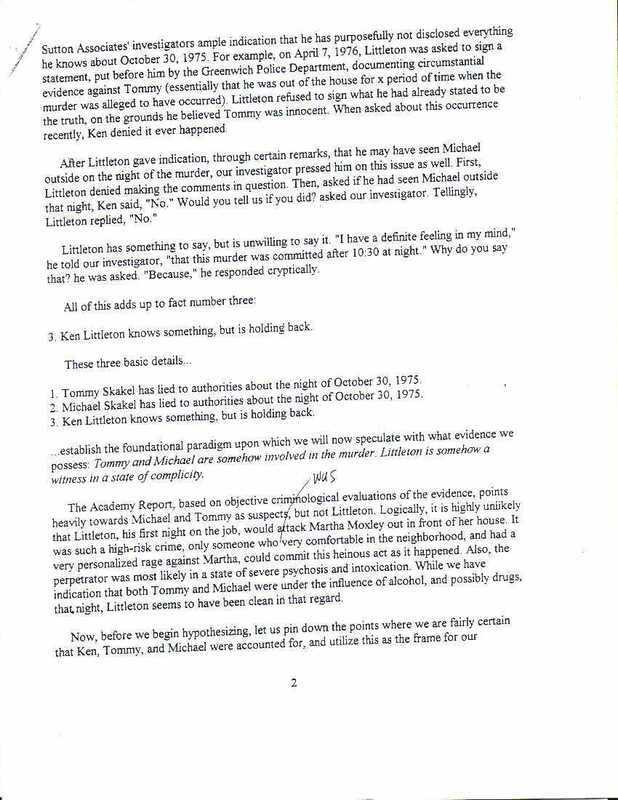 The Academy Report, based on objective criminological evaluations of the evidence, points heavily towards Michael and Tommy as suspects, but not Littleton. Logically, it is highly unlikely that Littleton, his first night on the job, would attack Martha Moxley out in front of her house. It was such a high-risk crime, only someone who (was) very comfortable in the neighborhood, and had a very personalized rage against Martha, could commit this heinous act as it happened. Also, the perpetrator was most likely in a state of severe psychosis and intoxication. While we have indication that both Tommy and Michael were under the influence of alcohol, and possibly drugs, that night, Littleton seems to have been clean in that regard.